Engine Timing Belt Kit with Water Pump GATES TCKWP297A. Application Summary - 2000 : 2007-01 Audi, A8, V-8 4.2 L, Timing Component Kit. Country of Origin (Primary) : US. Harmonized Tariff Code (Schedule B) : 8413309090. Interchange Part Number : PP297LK3, TB297LK2, TCKWP297A, TB297LK3, GTKWP297A. Life Cycle Status Code : 4. Number of Timing Belts : 1. Number of Water Pumps : 1. Other Part Number : BWPK42348, PP297LK4, 20371K, WPK42348, TB297LK4. Product Description - Abbreviated - 12 : Belts. Product Description - Invoice - 40 : Belts. 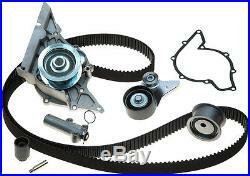 Product Description - Long - 80 : Timing Belt Component Kits wit. Product Description - Short - 20 : Automotive. Tariff Code : 8413.30.9090. See Item Specifics section for additional specifications about this part. To confirm that this part fits your vehicle, enter your vehicle's Year, Make, Model, Trim and Engine in the Compatibility Table. Also review the notes section in the compatibility chart for additional specifications about this part. This part generally fits Audi, Volkswagen vehicles and includes models such as A6 Quattro, A8 Quattro, Phaeton, RS6, S6, S8, Touareg with the trims of Avant Wagon 4-Door, Base Sedan 4-Door, Base Sport Utility 4-Door, L Plus Sedan 4-Door, L Sedan 4-Door, Plus Sedan 4-Door, V8 Sedan 4-Door, V8 Sport Utility 4-Door. The engine types may include 4.2L 4163CC V8 GAS DOHC Naturally Aspirated, 4.2L 4172CC V8 GAS DOHC Naturally Aspirated, 4.2L 4172CC V8 GAS DOHC Turbocharged. This part fits vehicles made in the following years 2001, 2002, 2003, 2004, 2005, 2006, 2007. This item may interchange to the following part numbers from other brands. Brands: ACDELCO, ACDELCO PROFESSIONAL, ACDELCO PROFESSIONAL CANADA, AUTOZONE/CRP, CARQUEST, CARQUEST/GATES, CONTINENTAL ELITE, CONTITECH, CRP, CRP CANADA, CRP/CONTITECH (INCHES), CRP/CONTITECH (METRIC-FULL), CRP/CONTITECH (METRIC-IMPORT), GATES CANADA, IMPORT DIRECT RADIATOR FANS, NAPA, NAPA/GATES, NAPA/WATER PUMP KITS-WPK, STANT Part Numbers: 20371K, BWPK42348, GTKWP297A, PP297LK3, PP297LK4, TB297LK2, TB297LK3, TB297LK4, TCKWP297A, WPK42348. ALL PARTS ARE NEW UNLESS NOTED AS RE-MANUFACTURED. COLOR OF THE ACTUAL PRODUCT MAY VARY AND COULD BE DIFFERENT FROM THE PHOTO!!! Portions of the part information on this page have been provided by WHI Solutions, Inc. The item "Engine Timing Belt Kit with Water Pump GATES TCKWP297A" is in sale since Friday, March 04, 2016. This item is in the category "eBay Motors\Parts & Accessories\Car & Truck Parts\Engines & Components\Timing Components". The seller is "aimsautosupply" and is located in Santa Fe Springs, California. This item can be shipped to United States, to Canada, to United Kingdom, DK, RO, SK, BG, CZ, FI, HU, LV, LT, MT, EE, to Australia, GR, PT, CY, SI, to Japan, to China, SE, KR, ID, to Taiwan, ZA, TH, to Belgium, to France, to Hong Kong, to Ireland, to Netherlands, PL, to Spain, to Italy, to Germany, to Austria, RU, IL, to Mexico, to New Zealand, PH, SG, to Switzerland, NO, SA, UA, AE, QA, KW, BH, HR, MY, BR, CL, CO, CR, PA, TT, GT, HN, JM.